An upcoming book shows that former President George H.W. Bush did not mince words when asked about President Donald Trump, back before Trump had won the election. The elder Bush also said that he voted for Clinton in 2016, while his son said he voted for “none of the above” as president and Republican candidates on the rest of the ballot. Their newly revealed criticisms of Trump come just weeks after George W. Bush appeared to criticize the president at a New York policy seminar, though he didn’t mention Trump by name. Though liberals have historically been sharp critics of the younger Bush — for reasons including the decision to invade Iraq, a slow and widely panned response to Hurricane Katrina, and his administration’s wholesale embrace of torture — his star has risen in the Trump era. In the wake of Trump’s frequent inflammatory comments and constant ad hominem attacks on Twitter, many people seem to long for a president who maintained a relatively more dignified demeanor. 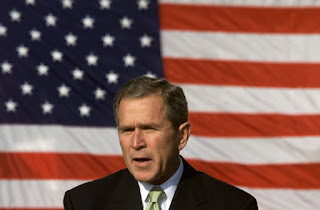 An October survey showed that 51 percent of Democrats hold at least a somewhat favorable view of Bush. On Friday, former MSNBC host Keith Olbermann — who has previously called Bush a fascist and a liar — said he owed Bush an apology and would prefer a third Bush term to Trump as president. Last year, the public went wild with glee over a photo showing Bush and Michelle Obama enjoying a brief embrace. All the newfound nostalgia seems to ignore just how terrible many people ― especially Democrats ― thought Bush’s presidency was at the time. For many, his lasting legacies are a disastrous Iraq war and the spread of chaos in the Middle East, as well as the financial crisis beginning during his second term. Some have argued those very conditions helped fuel the rise of the far right in the United States and abroad, paving the way for Trump to get elected.